With fall here, I love the fruits that come with the season. One of my favorites is pears, any variety will do. For our guest breakfast this time of the year, I do Caramelized pears as the fruit. They are so easy to cook, look just beautiful on the plate, and guest really seam to like them, since the plates are always clean. To Caramelize the pears, I melt a dollop of butter along with brown sugar in my skillet on medium heat. It depends on how many pears you are going to have in the skillet, the more you have the more butter and brown sugar you will need. Melt that together and swirl it around to coat the bottom of the skillet. While that is melting, cut the pears in half and scoop out the center to make a neat little hole, that we will fill later. Add the pears to mixture cut side down, cook them until they start to caramelize, when they are a golden color, then flip them over and finish cooking the other side. 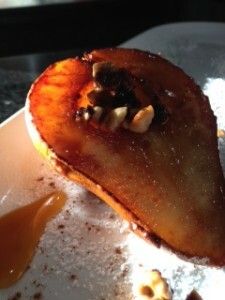 This entry was posted in Recipes and tagged breakfast pears, Caramelized pears, fruit for breakfast by admin. Bookmark the permalink.